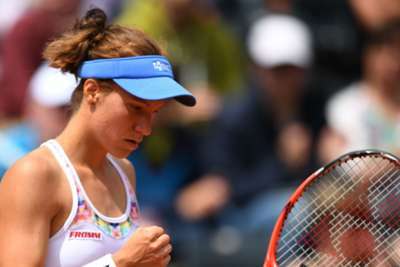 Viktorija Golubic beat fifth seed Laura Siegemund in the first round of the Ladies Open Biel Bienne on home soil and Julia Goerges was among four women to reach the quarter-finals. Golubic moved into the second round at the expense of the world number 37 from Germany, who was beaten 6-2 4-6 7-6 (7-3) in Bienne on Wednesday. Siegemund won the first three games of the third and final set, but Golubic came storming back to force a tie-break and maintained the momentum to set up a meeting with Aliaksandra Sasnovich. Second seed and wildcard Carla Suarez Navarro responded to her Monterrey Open semi-final defeat to world number one Angelique Kerber by easing past Julia Boserup 6-1 6-2 in the other first-round match. Viktorija Golubic battles past Siegemund 6-2, 4-6, 7-6(3)! The Spaniard, troubled by a shoulder problem since late last year, needed only 68 minutes to get the better of the unseeded American. Goerges, seeded seven, is through to the last eight courtesy of a 6-4 6-3 success against Oceane Dodin, while Kristyna Pliskova breezed past Donna Vekic 6-1 6-2. Elise Mertens and Anett Kontaveit are also through to the quarter-finals following wins over Mona Barthel and Evgeniya Rodina respectively.